However, with the floor raised, there's not enough height to be able to get it in the back, unless laid down - kind of defying the point! It was obvious that a section of floor would need to be removed, to get round this. Either at the rear, or the side. 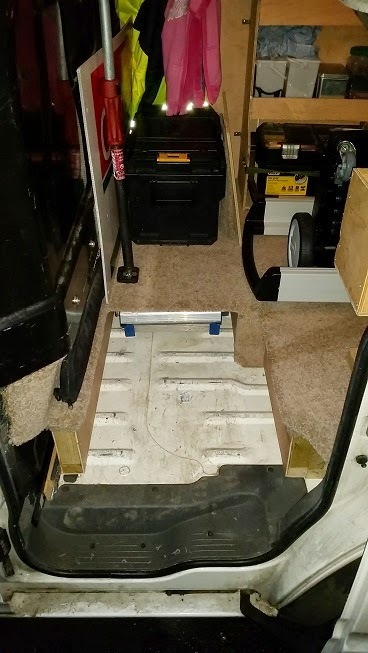 I opted to put it in the side, since although easier to go in the back, it would need to have been on the driver-side, and It made sense to have the load on the passenger side, since I rarely have passengers, Also it means for a better load distribution front-to-back too. It also makes it more convenient loading from the pavement. Better to have a slightly longer job today, than not be happy with the end result down the road. At first it seemed like it was going to be a pain to cut through the floor and the supports unless I removed all the flooring and emptied the back completely, But looking at the support on the right, it was actually going to be pretty easy once the floor piece came up. 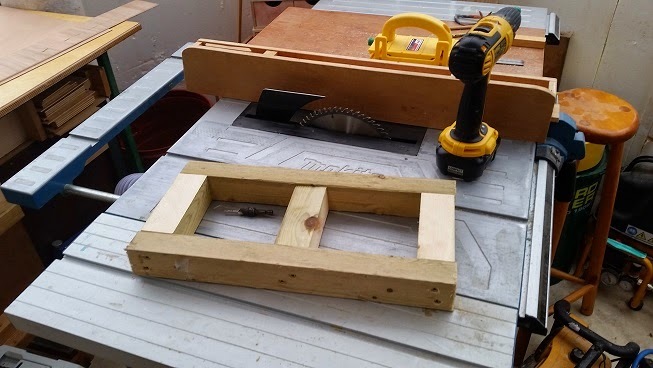 A circular saw and multi tool made short work of the plywood floor. I just ran the circ saw freehand along the lines then finished off with the multi tool where access was limited up to the bulkhead and at the corner. With the cutout made, and the flooring unscrewed, I was able to remove the two supports (one at a time). 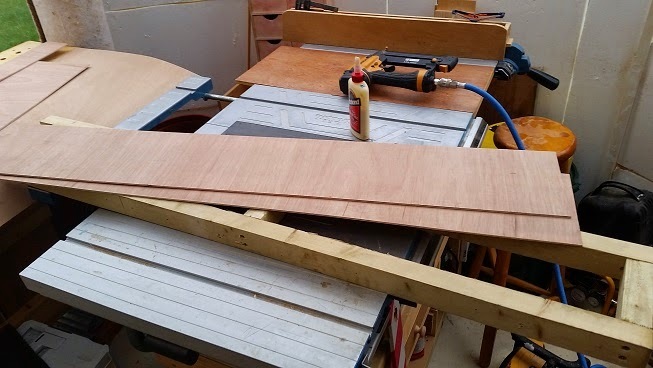 I decided to make use of some scraps of 4mm Ply and cover the exposed timbers, this not only gives loads more strength, but also stops things being snagged up when loading, unloading. 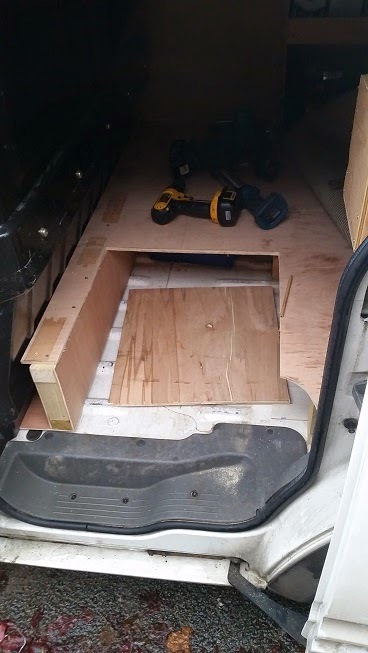 The solid bulk head thats fitted in the van has a slight angle to it at the bottom, previously I used the small space it creates to slide straight edges and levels in, but I decided to take the opportunity to slightly enlarge the space to make room for some saw tracks. I don't own a track saw, but in the future it may well be an investment I make, so I decided to put the room in now, rather than later. Until then it's still room for levels and clamp guides. 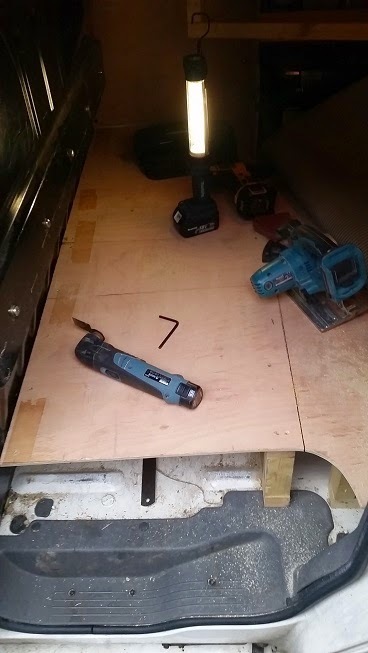 the piece of ply sets the distance from the bulkhead, and provides a sliding surface for things in and out..
With the new section fitted and screwed down, I cut a small strip off the old bit of floor and screwed it down too. This would them be carpeted down later, and mean more storage for levels and clamp guides. I could then turn my attentions to the support on the right of the side door. This was pretty much the same as the first one, just simply cutting it into two separate sections. 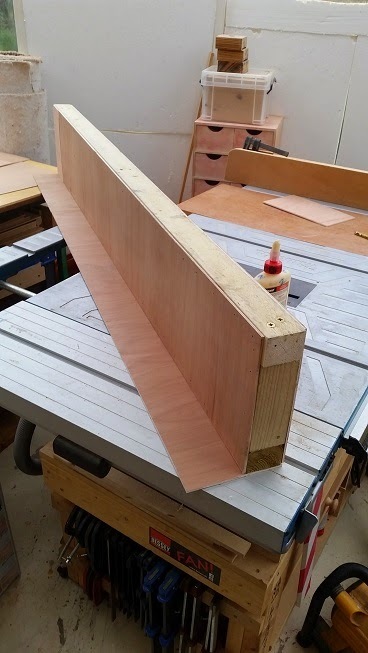 It had to be cut rather than just moved back, as the three other supports were in the way, so the longer section stayed more or less in the same place - this also helps take the weight of the shelves, once clad with plywood, I did the same with the shorter section. At this point I ran out of the original timbers so took two bits of 6x2 from the firewood pile and cut them to size on the table saw, then screwed them in place prior to cladding. This is a much better view of the separate pieces of the support. I always have this hop-up on board, and fortunately it is short enough to still fit next to the trolley. 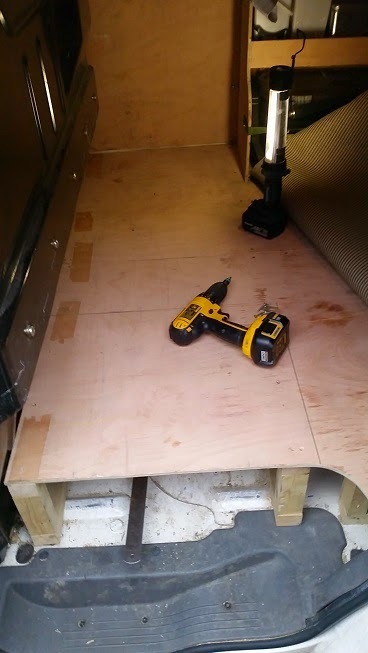 It's also far easier to load in and out, now the floor is removed. This is actually the same place it always lived, however I no longer need to reach under to get to it. 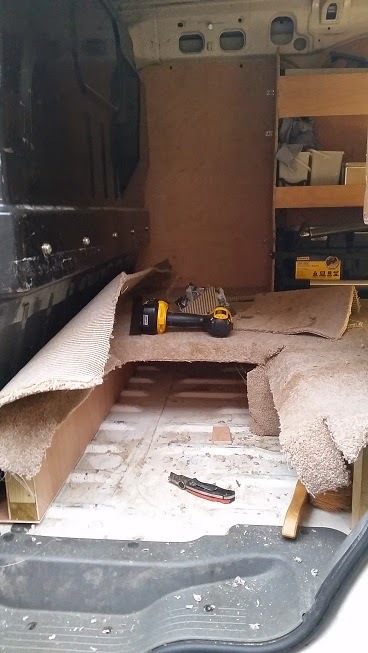 With the sections in place and covered in ply I re-laid the carpet and started to cut it round for a half decent fit. Originally I never got round to properly fitting the carpet in this section, but this time I decided to finish it off properly. A few minutes with a knife and stapler took care of fixing the carpet to the timber. I started off using 8mm T50 Staples, as the plywood is 9mm. Although it was apparent after the first staple that 12mm was required. I used Tensor L12 spray contact adhesive to fix the carpet to the metal bulkhead this time as, well - I had some. Previously I'd used double stick carpet tape to hold the carpet down, This made a much better job. I was actually pretty pleased. With all the carpet replaced, and the few bits loaded ready for later, it was time to move the trolley in too..............WAAAAAAAAIT!! You'll hopefully already have noticed that the trolley is in, but not "fitted". 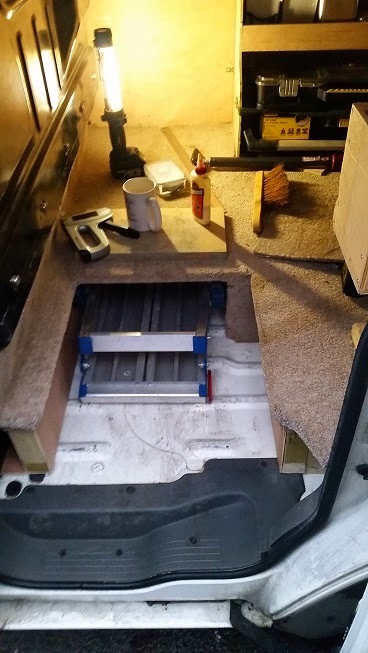 It was at this point that I realised that although the trolley fits in place nicely inside the van, it needed to be rotated slightly to load and unload it, as the top of the sliding door is lower than the roof. I must have had this in and out 20 times up to this point, and had to rotate it every time, but failed to notice what I was doing each time! 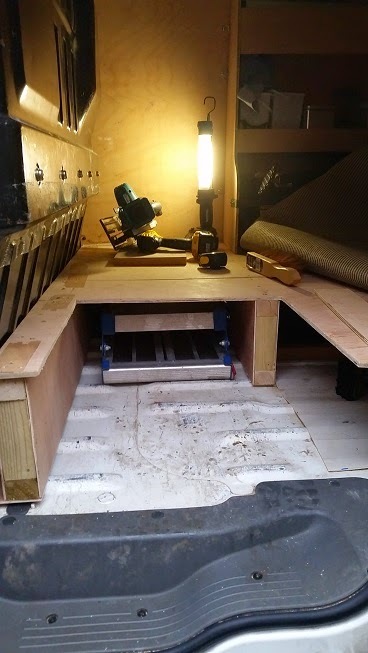 I was not overly impressed, as although it fitted perfectly in place once in, it was going to be a real pain loading and unloading when filled up with systainer boxes! To make the whole job worth the effort it needed to be able to be loaded straight and vertical not at an awkward angle. Maybe it would have been better to fit it in the back, as the doors are higher? The last few details to do were cut a piece of plywood to fit in the bottom of the so that the wheel nearest to the door is supported. 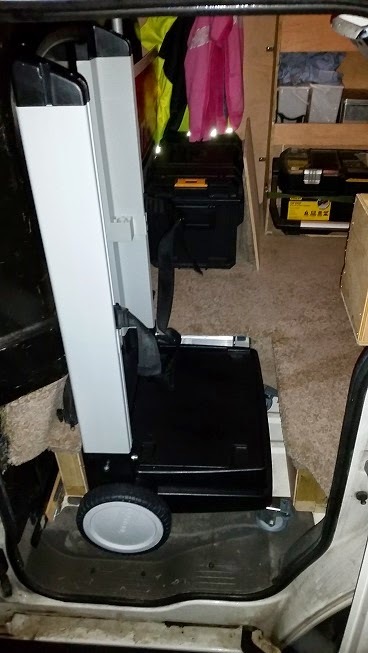 Due to the length of the hop-up, the width of the van, and the design of the door opening, the wheel is only partially supported, so I decided to add this in to hopefully, stop it sliding off and slipping into the door during transit. I also drilled the bulkhead through in two places to fit a securing strap to hold everything extra secure. Now hopefully I can load up the Sys-Roll with tools, unload it on site and make just 1 trip from the van to get the work done. 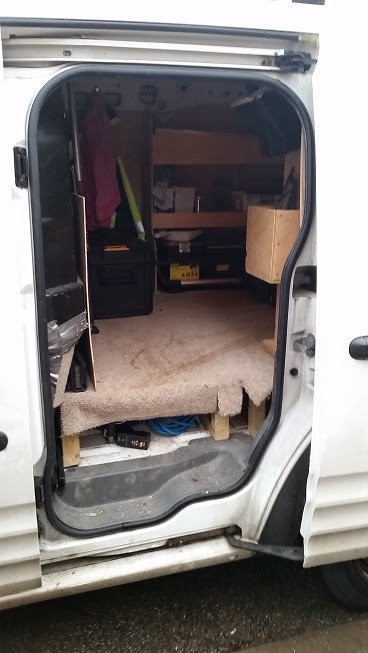 this means quicker setup/clear up times and get more done in a day.It also should make life easier unloading the van at night and have everything secure in the house rather than leaving it in the van overnight. The Last job once installed was to add a securing strap around the Whole trolley to fix it to the bulkhead, and stop it wandering or tipping about. 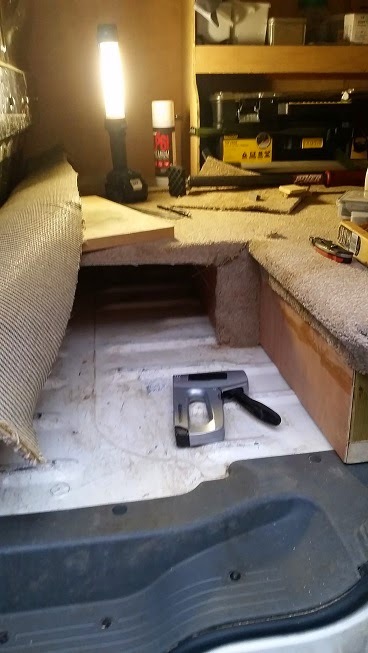 I also Glued a piece of carpet to the metal bulkhead to stop those annoying vibration noises you can otherwise only cure with the radio. 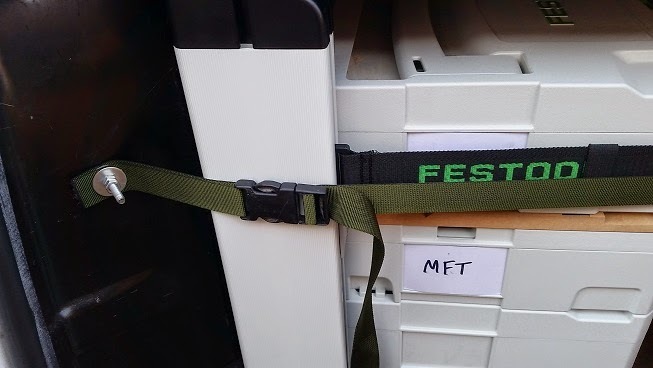 This could quite easily be used for a standard sack trolley, not just a festool specific model. Fingers crossed it'll save hours over the course of a month and beyond, particularly when visiting jobs that are difficult to park at etc. Don't forget to check out the sponsors, the youtube channel, and maybe sign-up to the newsletter to get alerts for new posts.